This Light Award is sponsored by Robo Advisor Apps and processed through Kiva.org. María studied only in the first grade at school, her parents' economic conditions were not very good since they had many children and they just put them to work. Her partner has died and her children emigrated to another country. María worked with her partner in a car repair shop but when he died, she could not longer continue with this work, however she began to sell fresh and dried fish in the city center. She goes twice a week to purchase the merchandise. 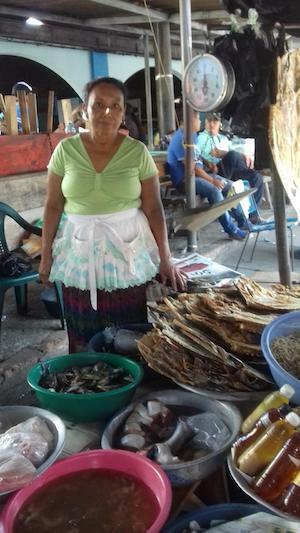 María needs the support of a loan very much to purchase dried fish to continue selling. She has always dreamed that her children will one day come back to see her and live with her in her last years. She wants to continue working to get income and continue surviving. Congratulations to Maria Del Carmen in El Salvador! For more information about other light workers, light resources, and light tools, see the navigation over to your left. Or learn more about the Perpetual Light Fund. Learn more about Great Mind Power Books and start gaining Power into YOUR LIFE! Potential Light Fund Recipients, keep sending your info. You may be next!